Diamond Head on Oahu is a volcanic tuff cone, created about 200,000 years ago by a volcanic eruption. Ancient Hawaiians first named the extinct volcano Le’Ahi for its strong Ahi-Tuna-fish brow like appearance. Diamond Head offers breathtaking views overlooking the Pacific Ocean and Honolulu. We stop at Diamond Head Beach Lookout during our private or Semi-private tours on Oahu with DanielsHawaii. Enjoy a beautiful Ocean view and maybe even see some whales during the Whale-Watching Season in Hawaii from November until April. Where does the name Diamond Head come from? British sailors, who came to Hawaii by boat in the 18th century, were fooled by sparkling calcite crystals glittering in the sun. They mistook them for diamonds. Guess, they where very disappointed when they did not discovered any diamonds, but Le’Ahi received its new name: Diamond Head. Today, the way up to the top of Diamond Head is well paved. It is about a 30 minute hike up to the top. From the top of Diamond Head, you have a great view overlooking Waikiki beach and Honolulu. If you don’t feel like walking up Diamond Head you can always fly over it in one of our helicopters. Enjoy a helicopter flight on Oahu over Diamond Head crater with DanielsHawaii. 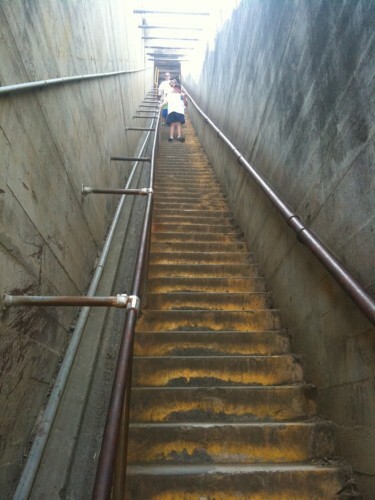 The way up the Diamond Head crater is easy and you can even wear flip flops. However, you should bring enough water with you, because it can get very hot during the day. Also, don’t forget to put on sun cream lotion! Did you know, that inside and around the crater, there was America’s first Hawaiian military base? Even today, the National Guard and the Hawaii Civil Defense are still stationed there. You need a bigger challenge? Come and Hike Koko Head Crater with us! Once at the top of the Diamond Head crater, you will be rewarded with an amazing view of Waikiki beach and Honolulu. You will need to enter the Diamond Head park from the eastern side, through a short tunnel that will bring you into the center of the crater, where you will start your 560 foot climb (99 steps) to the top of the Diamond Head crater. But don’t go through the steep spiral staircase inside the crater. The Diamond Head crater is Hawaii’s landmark, also because TV series like Magnum P.I. and Hawaii Five-0 were filmed there. If you plan to spend your vacation on Hawaii and you’re on Oahu, you should definitely visit the Diamond Head crater and enjoy the breathtaking views. Entrance fees are only one dollar and parking fees are $5. You can park right at the bottom of Diamond Head Park. If you have a van, the fees are $10. Make sure, you arrive early since parking is limited. The park closes at 6:00 PM, no one is permitted to hike after 4:30 PM, as the hike takes about a 1.5-2 hours (round trip). Open daily, 365 days a year, from 6:00 a.m. to 6:00 p.m. If you have more questions, contact us Facebook.